This past Saturday, Silka went to the market to pick up some ingredients for the coming week. 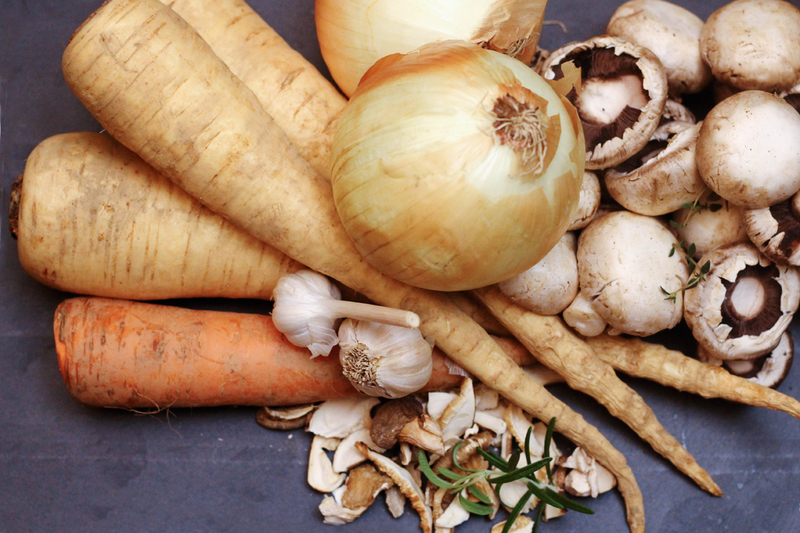 Without a real sense of direction, but knowing we would find a way to integrate pretty much anything into our meal plan, she grabbed a few staples including some gorgeous parsnips and a pound of bright, healthy mushrooms. 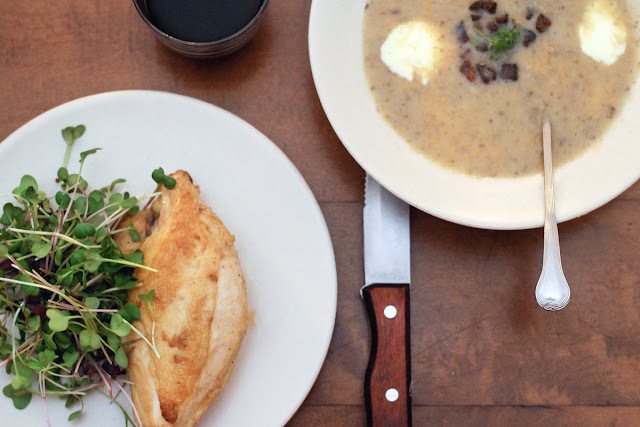 At home, while unpacking the market's bounty, Jake was inspired to make a parsnip and mushroom soup. We couldn't remember ever tasting that particular flavor combo, but it made sense to us! And it didn't take us long to find out that it also made sense to David Tanis, who had just written a recipe for Creamy Wild Mushroom and Parsnip Soup in the New York Times. It was almost exactly what we were looking for, but being the extreme fungus lovers that we are we decided to pump up the mushroomy-ness of the dish. The rest of meal fell into place fairly easily. 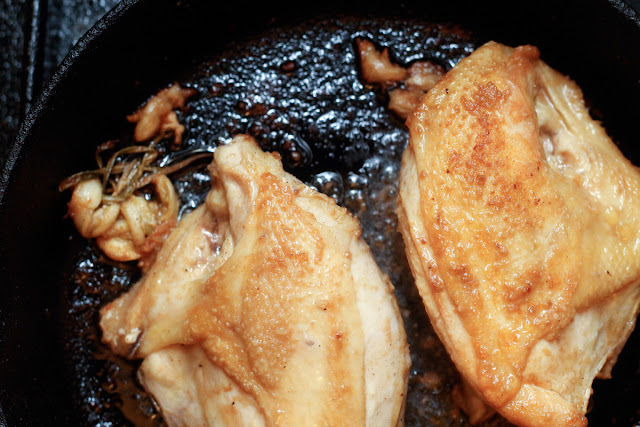 We had a couple of tasty-looking Belle Rouge chicken breasts from Violet Hill in the freezer, and we thought they'd go perfectly with the soup. And because we have recently become addicted to the micro radish greens at Two Guys, we served a handful on the side. So there we had it - a simple, tasty, and surprisingly light Sunday dinner. 1. Melt the butter in a deep heavy-bottomed soup pot over medium heat. 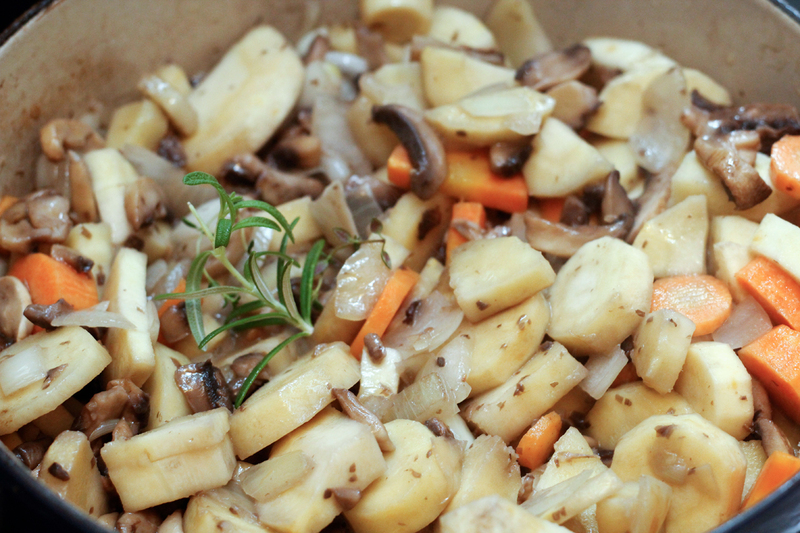 Add the onions, parsnips, carrot, sliced mushrooms, thyme, rosemary, and bay leaf. Season generously with salt and pepper. Cook, stirring frequently, until the mushrooms are fragrant and the onions are soft and lightly browned, about 20 minutes. 2. 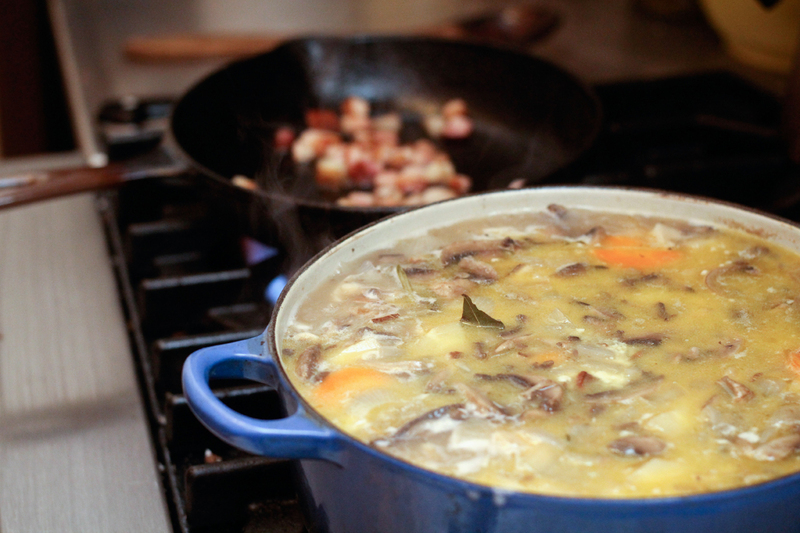 Add the broth and the soaked dried mushrooms. Bring to a boil, then adjust the heat to a gentle simmer. 3. Discard the bay leaf and thyme branch and add the crème fraîche. Purée the soup with an immersion blender or in a blender or food processor to your desired texture. 4. Garnish with parsley, and a drizzle of crème fraîche. Add some bacon bits on top if you'd like.